Fourth Corner Exchange Life Dollars are an electronic currency. We are unlike Time Banks in that we do not insist on an hour-for-hour equivalence in transactions. Each member is free to charge as many Life Dollars per hour as they choose. This allows professional individuals and businesses of any size to join our trading group and trade with members, and overcomes an otherwise restrictive limitation on trade. 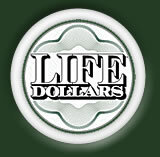 Like many European local currencies, our Life Dollars are created by members trading. There are always as many Life Dollars as members need to complete the trades they require. Unlike traditional money, issued by central banks, there is never a shortage of our currency. Our currency is issued in sufficiency by our members, as and when they need it. Unlike European local currency groups, we are not limited to a small geographic area. Our members can trade with any other member anywhere in the USA or the world. We are unique in this respect. Like many local and complimentary currencies, our Life Dollars are inflation proof, because our currency cannot be over-issued. Every Life Dollar that is issued is tied to an actual exchange of valuable goods and services between our members. This means zero inflation and zero deflation. We have created a powerful alternative money system that serves the needs of the citizens and is controlled by them through its issue. Our currency rebuilds local communities, restores economic equality and economic justice, rejuvenates local economies, eliminates poverty and unemployment, creates goodwill, trust and cooperation. No other alternative or complimentary currency has all these unique features.